I have written several times about Jennifer Goodman- Linn, and Cycle for Survival, the charity she co-founded with her husband Dave Linn. Jen was an inspiration to everyone whose life she touched, whether personally, or through her blog You Fearless, which chronicled her 7 year battle with a rare form of sarcoma that ultimately took her life in 20011. Her strength, honesty and positive outlook endeared her to many. 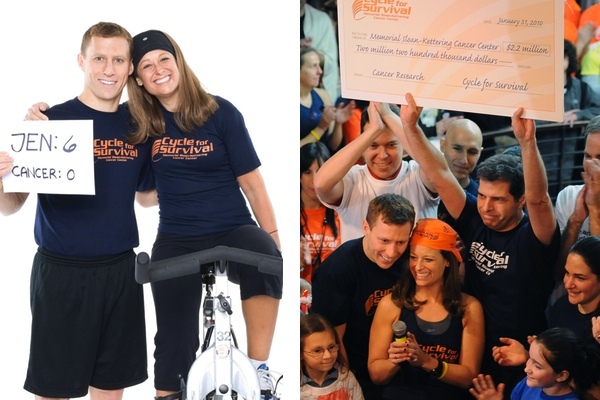 Her legacy lives on, through the incredible work being done by Cycle for Survival, which has funded 53 life sustaining clinical trials, and has raised over $24 million to fund research at Memorial Sloane Kettering Hospital in New York City. After sustaining 7 operations and unfathomable amounts of chemotherapy, Jen’s doctors feared she would not live to see her 40th birthday. Miraculously, she rebounded yet again, and was able to celebrate her milestone surrounded by her friends and family. In true Jen fashion, she posted a video of herself doing a silly “happy to be alive” dance, that touched the hearts of all who viewed it. Last week, her husband Dave faced his own 40th birthday, and wrote about it for the Huffington Post. He also generously offered to make a donation to Cycle for Survival for each comment his wife’s happy dance video receives. Take a moment to read Dave’s story, and watch Jen show you how to enjoy the gift of life, one silly dance move at a time. If you would like to support my team’ s ride, please click on the link below to donate to Shari’s Spinners. Although I am still recovering from my fractured knee, I am committed to being on the bike March 2, riding at Rockefeller Center for Cycle for Survival. This entry was posted on February 4, 2013 at 8:05 am and is filed under Uncategorized. You can follow any responses to this entry through the RSS 2.0 feed. You can leave a response, or trackback from your own site.